New research concludes that exposure to a combination of both arsenic and estrogen, at levels U.S. Environmental Protection Agency (EPA) considers “safe” for humans, can cause cancer at elevated levels. The higher levels of added organic brown rice syrup in soy-based formula may explain why some researchers found higher levels of arsenic in the soy-based formula. Combined with the presence of both phytoestrogens, soy-based formulas are a disease promoting ticking time bomb for infants. Texas Tech University researchers revealed that humans exposed to a combination of both toxicants were almost twice as likely to develop cancerous cells in their prostate. The study is published in the peer-reviewed journal The Prostate. The study contributes to the growing body of research on the interactive effects of pesticides on human health and the environment. For example, Tyrone Hayes, PhD., professor of integrative biology at UC Berkeley conducted research on the interactive effects of atrazine and other pesticides in a study on frogs. The study compared the impact of exposure to realistic combinations of small concentrations of corn pesticides on frog metamorphosis. Because arsenic has historically been used as a pesticide in orchard production, along with lead-based pesticides, Consumers Union, publisher of Consumers Reports, recently published an in-depth article looking at contamination in apple and grape juice. This is of particular concern because children drink a disproportionate amount of fruit juice, in terms of their body weight. There have also been widespread press reports of a recent Dartmouth study that focused on contamination in rice syrup, a sweetener. That study included a look at infant formula and soy-based formulas are particularly of concern. To make matters worse, Nestle and Mead Johnson Nutrition recently dismissed calls to remove genetically-modified organisms (GMO) from their infant formula products in the US and now evidence is coming forth on long-term risks related to infant formulations. True cancer of the prostate, carcinoma, is seldom seen in infants and children, but other forms of malignant tumors may develop and more cases are appearing in developed nations where the link appears to center around soy infant formula. While many claims have been made about the health benefits of these estrogen-like compounds, animal studies indicate that soy (both conventional and organic) contain powerful endocrine disrupters that alter growth patterns and cause sterility. 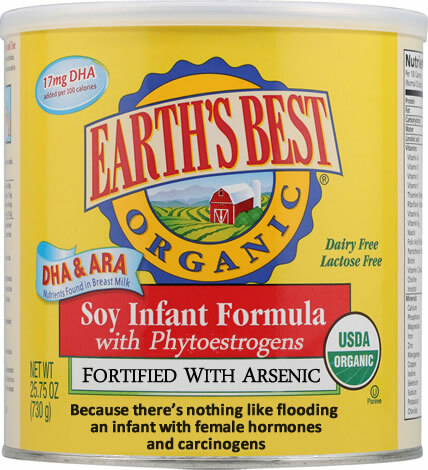 Toxicologists estimate that an infant exclusively fed soy formula receives the estrogenic equivalent of at least five birth control pills per day. By contrast, almost no phytoestrogens have been detected in dairy-based infant formula or in human milk, even when the mother consumes soy products. A recent study found that babies fed soy-based formula had 13,000 to 22,0000 times more isoflavones in their blood than babies fed milk-based formula. Scientists have known for years that isoflavones in soy products can depress thyroid function, causing autoimmune thyroid disease and even cancer of the thyroid. But what are the effects of soy products on the hormonal development of the infant, both male and female? Male infants undergo a “testosterone surge” during the first few months of life, when testosterone levels may be as high as those of an adult male. During this period, the infant is programed to express male characteristics after puberty, not only in the development of his sexual organs and other masculine physical traits, but also in setting patterns in the brain characteristic of male behavior. In monkeys, deficiency of male hormones impairs learning and the ability to perform visual discrimination tasks-such as would be required for reading-and retards the development of spatial perception, which is normally more acute in men than in women. It goes without saying that future patterns of sexual orientation may also be influenced by the early hormonal environment. Pediatricians are noticing greater numbers of boys whose physical maturation is delayed, or does not occur at all, including lack of development of the sexual organs. Learning disabilities, especially in male children, have reached epidemic proportions. Soy infant feeding-which floods the bloodstream with female hormones that could inhibit the effects of male hormones-cannot be ignored as a possible cause for these tragic developments. The new study by Texas Tech researchers on arsenic and estrogen confirms that co-exposures have a greater impact on human health, particularly for the development of prostate cancer. Researchers treated human prostate cells with arsenic, estrogen and a combination of the two once a week for six months to determine changes in prostate cells. The results have major implications because estrogen mimics are ubiquitous, such as bisphenol A (BPA) used as a liner in food cans. Similarly, while most arsenate pesticides were banned for use in agriculture in the U.S. in the 1980s, monosodium methanearsonate (MSMA) may still be used legally on cotton crops. Copper sulfate fertilizers have been found to be contaminated with arsenic. Other sources of exposure to arsenic include rice, an arsenic accumulator, and non-organically produced chicken. Poultry has become one of the most contaminated sources of meat available to humans, particularly due to approved arsenic-based additives which 80% of all chickens consume in their daily diet. With exposure to both arsenic and estrogen together showing synergistic impacts on human health, the research also highlights the deficiencies of EPA’s risk assessment process which fail to look at chemical mixtures, synergistic effects, as well as certain health endpoints such as endocrine disruption. These deficiencies contribute to its severe limitations in defining real world poisoning. We may need to teach ourselves about the ‘bats and the bees’ if we want to keep feeding ourselves. Research is now confirming what has been observed by many farmers: Bats are necessary for keeping many types of crop-eating insect populations from swarming, and their populations are becoming dramatically reduced due to the widespread use of pesticides on our crops. 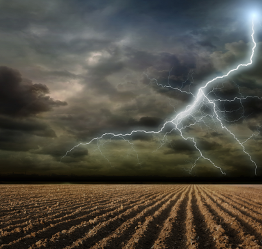 They determined that the bats tracked and migrated with the moth infestations, and fed off of the moths where they gathered – among corn crops. The bats were found to migrate to moth infestations, dramatically reducing their populations. The evidence provided confirmation that bats are lethal predators of these and other pests that threaten our crops. At least 70% of bats are insect-eaters. The type of insect eaten depends greatly upon the species. There are over 1,200 species of bats. They will typically eat the insects known to infest that particular geographical region, but many also migrate with the insects as determined in the Tennessee research. Some bat colonies have been observed eating tens of thousands of pounds of insects each night. The problem, however, is that bat populations are being reduced in many areas, and researchers are suspecting the involvement of pesticides. This is concerning numerous bat and environmental experts, who have connected insect infestations to bat population reductions. According to the Bat Conservation International, a group committed to the conservation of bats, more than 5.7 million (and possibly up to 6.7 million) bats have died from a disease called the White-nose Syndrome. The disease appears to be connected to a fungus, but is also related to immunosuppression among the bats. The syndrome is strikingly similar to the bee’s colony collapse disorder, which many have attributed to a virus, but more recent research is connecting the disorder to pesticides. The research on CCD among bees has increasingly indicated that pesticides weaken the immune system, allowing the infection to take hold. Now this connection is also being made among bats. Researchers from the State University of New York and the New York State Department of Health with the Department of Environmental Health Sciences released a study that illustrated that bats were accumulating toxic chemicals from pesticides and these were connected with their subsequent immunosuppression as well as hormone disruption. They found that little brown bats found diseased with the White-nose syndrome also had significantly high levels of several pesticide- and herbicide-related chemicals in their fat tissues. These included polychlorinated biphenyls (PCBs), polybrominated diphenyl ethers (PBDEs), polybrominated biphenyls (PBBs), organochlorine pesticides (OCPs which include DDT, chlordanes, HCB, and HCH). They found the highest levels of PCBs and PBDE concentrations in the bat fatty tissues were related to bats from regions with cropland spraying of pesticides. 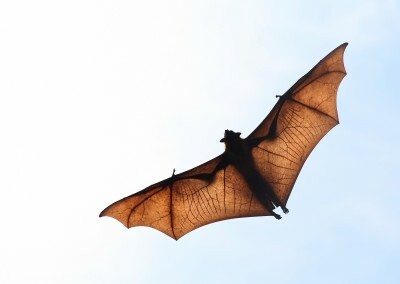 The connection between declining bat populations and pesticides is also beginning to unfold among other research. Researchers from Germany’s University of Koblenz-Landau tested bats and bat activity among apple orchards before and after the orchards had been sprayed with pesticides. They found that bats were increasingly retaining pesticide residues and this was decreasing their activities and populations among the orchards. Bats typically will have only one offspring, meaning that re-population of bats is a long and difficult process. The loss of our bat populations will not only produce greater incidence of pest infestations. Many species of bats are important pollinators for many types of fruits. These species of bats prefer eating pollen to eating the insects that attack plants. The bats go from flower to flower eating pollen. Some of that pollen gets stuck in their fir, getting carried to other flowers. This effective pollination method is very similar to bees who transfer the sticky pollen from plant to plant as they harvest different flowers. Most bat experts agree that bats are still somewhat mysterious due to their nocturnal activities. We are slowing realizing – and possibly too late – is that our widespread use of chemical pesticides is backfiring. Not only are we becoming poisoned by them: Those beneficial species that work alongside our food crops to assure their pollination and pest control are also becoming poisoned, and this may well threaten the future of our food supply. How much of a risk is West Nile Virus (WNV)? To some extent, only time will tell. But public health experts stress that there is no cause for fear and panic, or for panic driven “solutions.” In fact, the so-called “solution” of spraying pesticides to kill mosquitoes will actually lead to bigger problems. Here are eight compelling reasons why spraying pesticides is not the answer to WNV. The US Center for Disease Control and other experts say that spraying or fogging is the least effective means for slowing the spread of WNV carrying mosquitoes. For fogging to have maximum effect, a mosquito has to be flying. Estimates are that fogging kills only about 10% of adult mosquitoes. The federal-provincial task force on WNV admits there is little evidence for the efficacy of insecticide spraying. Adult mosquitoes live only about two weeks, with new larvae hatching constantly. This means that spraying cannot be a one shot operation, but needs to be repeated frequently if chosen as a means of control . Aerial spraying or fogging is more harmful to mosquito predators than to mosquitoes. Since predators are farther up the food chain, they will take in higher amounts of pesticide. By decreasing mosquito predator populations, aerial spraying actually leads to increases in mosquito populations. Data from a study in New York State published in the Journal for Mosquito Control found that after 11 years of insecticide spraying, the mosquito population had increased 15 times. Pesticide exposure also results in immune suppression in birds, which serve as the hosts for WNV. Birds exposed to organophosphate pesticides tend to suffer immune suppression (as do mammals, amphibians and other animals.) This makes them less able to fight off viral and bacterial infections, the very opposite of what is needed. Once infected with WNV, birds are more likely to develop symptoms and to remain ill longer than if they had not been exposed. Thus, pesticide spraying leads to more frequent and longer infections and higher viral loads in birds, making it more likely they will spread the disease to mosquitoes. This increases the possibility of mosquitoes transmitting the virus to humans and other mammals. For some reason, as yet unknown, mosquitoes exposed to pesticides are more likely to have WNV in their salivary glands and develop a damaged gut lining which becomes more porous, allowing WNV to pass through. Over a decade of insecticide spraying to control encephalitis in Florida has not been effective, and mosquitoes are now 15 times more likely to pass on the disease. Mosquitoes, which have short life spans, go through many generations in a single year. The mosquitoes which are exposed to pesticides and survive are more likely to develop resistance to them. So aerial spraying contributes to the development of “super mosquitoes” which can only be killed by using higher amounts or different types of pesticides. Pesticides used in mosquito control can contribute to immune suppression in humans. A report from the World Resources Institute notes, “Impairment of the immune system by chemical pesticides can lead to allergies, auto immune disorders such as lupus, and cancer. It may also lead to infections to which one may be normally resistant.” People with weakened immune systems are the most vulnerable to WNV. Thus, in the long term, aerial spraying may actually increase the number of people who become seriously ill from WNV. And immune system suppression has serious implications for other diseases as well, including SARS. Malathion, Naled and Resmethrin are pesticides commonly used in mosquito control. Malathion, an organophosphate, is neurotoxic. It is the most common pesticide used in aerial spraying. In studies on rats, pesticides were shown to impair the blood-brain barrier. In humans, the more serious effects of WNV occur when the virus crosses the blood-brain barrier. Malathion, like all members of the organophosphate family, disrupts nervous system function. Besides causing headaches, nausea and diarrhea, it has been linked to gene damage causing attention deficit hyperactive disorder (ADHD). Other heath hazards identified in laboratory studies include damaged sperm, altered immune function, increased incidence of breast tumors, and increased risk of non-Hodgkin’s lymphoma. Naled is another organophosphate which disrupts nervous system function, also causing headaches, nausea and diarrhea. Naled is most toxic when exposure occurs by inhalation. Lab tests connected exposure to Naled’s breakdown product, dichlorvos, to aggressiveness and deterioration of memory and learning. Dichlorvos is also classified as a carcinogen, and interferes with prenatal brain development. Resmethrin is considered by the World Health Organization as a “neuropoison.” Its effects on the human nervous system are similar to its effects in insects. Lab studies on rats showed that Resmethrin interfered with reproduction, increasing numbers of stillborns even at the lowest exposure tested. Most of the pesticides presently used for mosquito control do not selectively target mosquitoes. Malathion, Naled and Resmethrin kill all insects. This includes hundreds of beneficial insect species that pollinate crops and keep pests under control. Malathion is known to contaminate water, and is classified as highly toxic to most species of fish. In 1999, 90% of adult lobsters in Long Island Sound were killed by malathion used on land. Fish kills in the thousands have been reported following mosquito spraying. Since some species of fish feed on mosquito larvae, this is doubly counterproductive. Other organisms that feed on mosquito larva are also killed. Bird populations are also threatened. According to New York State wildlife pathologist Ward Stone, more of the birds sent to his unit for examination in 2000 died from pesticides than from WNV. Among the more frequent causes of bird death were broad band insecticides from the organophosphate category such as Dursban, diazinon and ethylparathion. Organophosphates used in mosquito control add harmful volatile organic compounds (VOCs) to the atmosphere, and are precursors of ozone (smog) forming chemicals. This means they are contributors to global warming. While the image of a new killer virus from the tropics is scary and makes for good media material, public health experts at all levels are attempting to help people put WNV in perspective. West Nile Virus is less dangerous than the flu. Only 1% of mosquitoes carry the WNV, even in places where WNV has been common for years. Because of our climate, the virus is not expected to overwinter, but would likely be reintroduced each year through bird migration. Less than 1% of people bitten by infected mosquitoes will have any symptoms, and most of those will be equivalent to a one day flu or headache. Studies in New York when WNV was most widespread found thousands of people who tested positive for WNV but had never experienced any symptoms of illness. People bitten by infected mosquitoes, even those who experience no symptoms, will develop a lifetime immunity to the disease. In Africa and Europe, the virus occurs in cycles, with typically three years of human infections in late summer, with the majority of infections in the first year of a cycle. Then the virus fades into the background, and may not reappear for many years. In Africa, WNV is a childhood disease; adults have developed immunity. WNV may be one of a number of tropical diseases which will spread to our geo- graphic area with global warning. Instead of panic and sensationalism, we need a rational, long term problem-solving approach which is healthy for humans and the environment. Reducing mosquito breeding sites (standing water), known as source control, is the most effective mosquito control method. Since adult mosquitoes seldom travel more than 1 kilometer, source control in a neighborhood can be extremely effective and quite non-toxic. Experts stress the value of source controls such as mechanical flushing of sewer catch basins, and introduction of dragonfly larvae in nearby ponds and lakes. These methods have been practiced with great success in Wells, Maine for 26 years. Maintaining healthy mosquito predator populations is an important part of a mosquito control strategy. Eliminating mosquito larvae, through predators and biological means and if absolutely necessary via pesticides, is far more effective than trying to kill adult mosquitoes. And ultiimately, the most effective defense against WNV is a healthy ecosystem and a healthy immune system in humans, birds and other species. Most shocking, the farmers were ordered to discard leftover herbicides and pesticides in locations in which they leached directly into the water supply. With Monsanto’s Roundup already known to be contaminating the groundwater, this comes as a serious threat to pure water supplies. The farmers end their landmark case with an explanation as to why the tobacco companies allowed Monsanto’s herbicides and pesticides to be unloaded on the small family farms in such vast quantities and purchased in excessive amounts. In their claim, the farmers state that the tobacco companies were ”motivated by a desire for unwarranted economic gain and profit,” with zero regard for the farmers and their infant children — many of which are now suffering from severe birth defects from Monsanto’s products.In a developing news piece just unleashed by a courthouse news wire, Monsanto is being brought to court by dozens of Argentinean tobacco farmers who say that the biotech giant knowingly poisoned them with herbicides and pesticides and subsequently caused ”devastating birth defects” in their children. The farmers are now suing not only Monsanto on behalf of their children, but many big tobacco giants as well. The birth defects that the farmers say occurred as a result are many, and include cerebral palsy, down syndrome, psychomotor retardation, missing fingers, and blindness. The farmers end their landmark case with an explanation as to why the tobacco companies allowed Monsanto’s herbicides and pesticides to be unloaded on the small family farms in such vast quantities and purchased in excessive amounts. In their claim, the farmers state that the tobacco companies were ”motivated by a desire for unwarranted economic gain and profit,” with zero regard for the farmers and their infant children — many of which are now suffering from severe birth defects from Monsanto’s products. Food tasting a little on the “chemical” side lately? Water smelling and tasting a little off? And as the second “green revolution” of Monsanto’s GMO crops and subsequent sales of Roundup pesticides for use with those crops increases exponentially, so does the water pollution. The main ingredient in Roundup is glyphosate. But what most don’t know is that for its proprietary pesticide mixes, surfactants are used. Surfactants ride in on the glyphosate as inerts, with the glyphosate acting as a sort of Trojan Horse. No one has to know they are there, and they can be deadly.